Off to Halifax in the morning. The purpose of the visit is to kick off The Kickstand Sessions - Bicycle Policy Training Sessions. 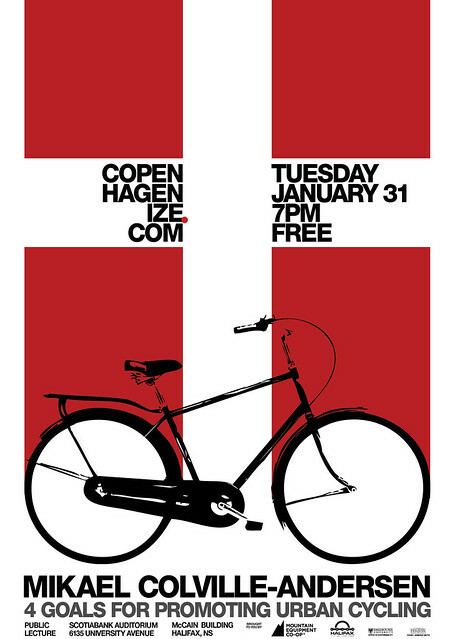 Copenhagenize Consulting has teamed up with Mobycon from the Netherlands to host comprehensive bicycle policy training sessions for professional planners, traffic engineers, architects, marketing people and NGOs. Both Mobycon and Copenhagenize Consulting see more value in combining Dutch AND Danish best practice and policy in order to provide inspiration for local solutions in cities. There seems to be a bit of "bicycle nationalism" gaining purchase and when the goal is inspiring cities around the world to starting placing the bicycle higher up on the traffic pyramid, all the good experience should be presented all at once. The "bicycle embassies", it would seem, are interested in providing a platform for local companies to present their products to a wider market. Fair enough, it's a market economy. Goods and services must be sold. We just think cities should be given the chance to see the wealth of ideas at their disposal, regardless of national origin, in order to kickstart an urban planning and traffic engineering revolution. We're looking forward to launching the Kickstand Sessions in Halifax. Our partners in the city have informed us that a number of city councillors will be attending and the Premier of Nova Scotia, Darrell Dexter, will also be present on the last day to hear what kind of solutions the training session participants have come up with for Halifax and other towns in the province. It's going to be great. On Tuesday, I'll be also speaking at Dalhousie University with my Four Goals for Promoting Urban Cycling talk - as well as a bit of Bicycle Culture by Design. Thanks so much to the Halifax Cycling Coalition for producing the above poster. Atlantic Canada, here we come.